Ever increasing forms of social media and continue to expand the ways in which we can root, root, root for the home team, but one thing still connects all generations of baseball fans – still photography. Is there anything more unique to a modern historic baseball moment than the sight of 40,000 digital cameras flashing at once? Unlike many other sports, the pace of a professional baseball game creates a synergy with its fans by encouraging them to bring their cameras to games, beginning with increasingly regularity in the late 1940s and early 1950s. Teams would designate a specific day when fans would be invited to photograph their favorite players. This promotion became known widely as “Photo Day” or “Camera Day” and remains popular today. The rhythms of the game day experience provide fans with the opportunity to snap a photo prior to that first pitch, during the action and then after the last out of the game is recorded. The subject matter could be that of a ballpark, a player entering the facility, a player signing autographs during batting practice, or perhaps long after the game’s conclusion when a fan engages a player quite by accident in a place of public accommodation. These snapshots create a timeless record of a fan’s baseball experience. The photos have been taken by fans who are amateur — not professional — photographers. The photos are not the most artistic, composed or focused images. They are a personal and poignant moment for the photographer. The typical baseball fan’s vision of his or her experience as seen through the lens of a camera has seldom been promoted. The “big picture” of baseball that photos portray collectively will provide an insight on what was and is important to the fan. This book features never before seen pictures of players great and not quite, in ballparks long gone or vaguely familiar, in settings major and minor, in black & white and color, on field and in civilian clothing – a feast for the eyes of fans who have thought they’ve seen it all. Many teams and eras are represented, and among the finds is a snapshot of Roberto Clemente looking up for the photo, Chico Ruiz at the Angels camera day promotion, Sandy Koufax playing golf, Eddie Mathews stepping out of a shower, a sunset at the Mets Citi Field and a blurry Babe Ruth, leaving Yankee Stadium with his daughter. 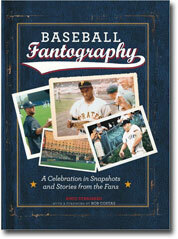 This is the ultimate collection of undiscovered baseball imagery as captured by adoring fans. Accordingly, the focus of this project is fans capturing their special baseball moments through the use of their photographs. In truth, the finished project is about the fans, by the fans and ultimately, for the fans. What a gift to baseball.